Update: The winner is Ronald DeHoogh. I’m partnering with my friends at Bering’s to giveaway this 3 Piece Stainless Steel tool set.. There will be one (1) winner who will receive this giveaway. This Weber barbecue tool set is the right way to round out the griller’s toolbox. 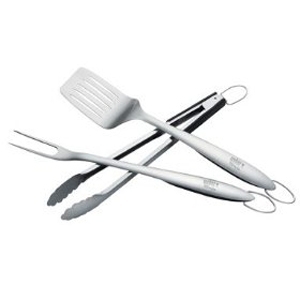 The 3-piece stainless steel set includes a spatula, chef’s tongs, and a barbecue fork. Dishwasher Safe. Log in to register to win this 3 Piece Stainless Steel tool set. To enter, please enter your first and last name with a valid email address.